Equally significant, He added an interesting observation: "Truly I say to you, this generation will not pass away until all these things take place" (Matt. 24:34). What generation? The generation that sees the fig tree blossom. And I say Praise God! Come Lord Jesus! in lukes gospel he uses ALL the trees. it seems to me that the evidence and context that the fig tree here is inconclusive. 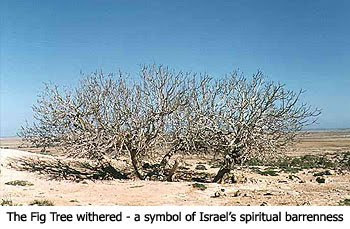 i have heard many, many people use evidence the the fig tree is NOT the rebirth of isreal. what do i tell them? can we be certain thats what he`s saying? i`m not trying to be testy, i just dont wanna have a false hope believing he`s returning this generation and find out im destined to live a life of drudgery on this God forsak(ing) planet. I think you've honed in like a laser beam on the fig tree while letting ALL of the prophecies of the end times blur out of focus. Though I trust the content of Dr. Reagan's article (for I am not a scholar) for the sake of argument lets say he is incorrect. 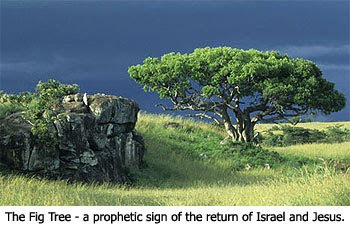 Is the fig tree example the only thing you are watching for in relation to end times prophecy? I doubt it. Take your eyes off the fig tree and look at everything else and I think you will believe we are in the season of the Lord's return. Dawg said "i have heard many, many people use evidence the the fig tree is NOT the rebirth of isreal. what do i tell them?" I'm turning the question around. What do THEY tell YOU that the fig tree IS referencing? Dawg, like you I get impatient and want Jesus to come NOW so I can get out of this wretched world we live in. But remember, there are still people out there that are to destined to receive salvation thru our Lord and He won't return until they've done so. (The time of the Gentiles fulfilled). So be patient for their (our brothers) sake. Trust in God to send His Son for us at the time He knows best - it's hard, I know, but hang in there! i heard many more things but i dont wanna bore the other readers. i`m hoping they`re mistaken. i also heard in the apocolypse of peter (NOT THE BIBLE, but a commentary on what the 2nd century people believed) that it WAS the rebirth of isreal. But fellas (Dr. Reagan too) isn't the return of Jesus spoken of in relation to all of the "signs" (inc. Israel) focused on His second coming to earth, the physical return to a real throne? I think it equally important to remember the Rapture we long for could happen in a flash - independent of any signs. Doesn't Matt. 24:40-41 refer to the Rapture? A pastor friend didn't believe that but my line of reasoning to him was that if the Rapture had signs then it couldn't catch us off guard as is indicated in these verses. Signs would give us warning and we could wait to "pack our bags"... spiritually speaking. As for the fig tree parable I too have read teachers who say that this isn't a referral to Israel. When in doubt though I think it best to use the Bible to cross reference the Bible, not secondary sources. One such reference is the dry bones of Eze. 37, this clearly referred to a dead and gone Israel coming back to life. And my understanding of history is that even though Israel would be taken captive and removed from the land prior to Rome and Jesus there was always a sizable remnant left behind in the land (Israel may have seemed dead but there was still some flesh on the bone). It wasn't until after the destruction of the Temple that Israel would be completely scattered without a sizable remnant (and could be called dead with no flesh to the bones). So I believe the parable is referring to Israel and no other. And I have understood that the re-birth of Israel in our times was THE major indicator from God to believers, not un-believers, that we are in the last days. It is His reminder that time is of the essence and it is critical for Christians to live every day for our Lord and Redeemer(Matt 22:37-40). Remember non-Christians will not be heeding these signs or teachings, no they mock us daily in the news and entertainment worlds, so this is for us. BTW I feel like an idiot commenting on this subject on a blog site run by such a Godly, Biblical scholar as Dr. Reagan. Please feel free Dr. Reagan to disabuse me of any misunderstandings I may have. I just listened to Benjamin Netanyahu's speech to the U N. Wow! How prophetic his words were and how close we must be Christ's return. I am fearful for the lost ones that I know. Even so, Come quickly,Lord Jesus! no hartdawg, I didn't think that of your reference at all, we may have discussed interpretations that differ but never the basics of inerrancy of Scripture. besides I don't even know what the apocolypse of Peter is. You know me by now...I just get a goin' and like to ramble and I often like the taste of shoe leather. no rob, actually you made a very good point. some would say scripture stands alone. i say scripture CAN stand alone, but many outside sources back it up. if they dont then the error lies within the outside source. i`m not sure of the accuracy of the apocolypse of peter, too many false gospels. i just think it was a good commentary on how scripture was interpreted. kinda like the writings of ephriam the syrian. hay anon, could you sum up what netanyahu said to the united nothing? i missed it. Hartdawg, not to put too fine a point on it buuut...the Scriptures do stand alone, utterly alone, as divine Scripture useful for rebuke, correction and teaching. Any secondary sources must be verified and corroborated with exacting care against the original. They do not back up the Word, the Word backs them up. That said I do like Godly men and women who have been gifted to preach and teach the word through the pulpit and secondary written works. I admit that I have indeed learned much from the wise council of Dr. Reagan, Alistair Begg (sp? ), David Jeremiah and others. They have helped me understand God and His plan - and I try to test their spirits against the Word so even they don't get a pass. But I want to know the Author more than His scribes. I know this is probably what you meant - truly, no insult intended to you my brother in Christ. I just felt a need to clarify. I think Jesus is past the gates. Oh how I would love to see Him now! Not later, not eventually, not soon, but now! Thank you for the lesson of the fig tree. I think plenty of Christians will be caught off guard with the Rapture even with all the signs out there. I say that because most Christian I know have extremely limited (if any) knowledge of or interest in the Rapture and the end times. So I would not necessarily say the Rapture will/may be separate of signs of the times in order to catch Christian off guard. Jesus will come like a thief in the night at the time of the Rapture which will catch non-believers completely off-guard and some Christians as well (most of the ones I know anyway). But Jesus coming for us at the time of the Rapture will NOT catch (most) Christians off-guards. Billy - I agree that most true Christians, those acknowledging Jesus as the Way the Truth and the Life, will not be caught off guard in the literal sense, but I would have to think on the signs part. BTW - speaking of living in the last days. I would like to have a discussion with men (and women) of God who understand we are in the Last Days and yet still have a practical view of how we should live in such times. As I have said before I have a wife and 5 children who depend on me for leadership and security. I am but one lone idiot and would like to get thoughts from like minded brothers in Christ so I can learn from you. I of course have thoughts but "As iron sharpens iron so one man sharpens another" (Prov. 27:17). Just to give a practical example of my thinking, warped as it may be, is the issue of homeschooling. There is a UN bill of rights for children that could make it difficult or illegal for me, a US citizen, to do such schooling. I understand the current congress very well may pass this bill that even Bill Clinton refused to sign so the Homeschool Legal Defense People are closely watching this one. If it were to pass it would be no big deal to gather the records of homeschoolers, we have to register with the County Bd. of Ed. here, and begin "assimiliating" us back into governement uneducation schools, I mean gubment skoolin, ah you know. No offense meant, I am the product of public education adn there are some good schools still. I just believe the worldview espoused and quality produced are not for my family. We feel this is God's call for us. If they try to take away my freedoms on this I want a plan on how to resist, I will flee from the authorities and act within peaceful reason, but make no mistake I will fight back with force if any goon tries to take my children from me...I feel that is my Christian duty to the kids my God has entrusted me with. Yes God is in control and He will care for my family, but I really believe He expects me to use all the strength He gives to do my husbandly, fatherly duty. How could we create a thread on the Facebook page? Or am I crazy? On second thought don't answer that one. Now that my ignorance is out for all to see, let's talk about it. When Luke writes of ALL the trees, could he not have been writing about ALL the prophetic signs blooming with the fig tree being central to that event? And my take on the blooming of the fig tree is the rebirth (the blooming) of the Jewish nation in 1948, which would put the event in line with the Baby Boomer (post World War 2) generation, which, interestingly enough, just happens to be the very same generation which is in power as all these prophetic signs come into bloom. In fact, many of them are involved with these events: one world gov't, religion, currency, etc. My husband and I are right there with ya brother. So, if you're crazy, that includes us. Things are getting bad, and will only continure to slide further in that way. I think we had a thread going here on L & L on that in the not too distant past. Were you in on that??? Oh, and did you see my post regarding using the "Name/URL" feature down at the bottom, where you send your post?? No info required to use it, like the "google" acct. Just click on the "name/url" and then type in your name.....Rob, or Rob from Alabama. I post like this, as I do not like to spread too much info around either. Which of us here at not going crazy over this world we live in? rob, semantics, thats all. we meant the same thing. billy, the rapture will catch many christians off gaurd, i mean, prophecy isnt important right? it only divides and the bible is vague right? (yes, its sourcasim). all signs point to the 2nd coming not the rapture. Bugg, yes we did and I was there for that thread. If I have to go on the lamb can I come to yo crib for the crashin' (just got back from youth rally)? My brood likes sweet tea and Dr. Pepper, PB&J is good too :) Seriously though I have put some minor bwain power to asking what if questions and have come up with my answers. But I am interested in secondary perspectives. I have read where in N. Korea the Christians know each other but any group larger than 2 arouses suspicion. So they meet on park benches and act like they're feedin the boids, yet in reality they share a quick verse or praise report/prayer request. Ten minutes tops and time to move on or risk arrest. Is this where we are heading? WIthout God or Godly principles in our nation I believe anything is possible. And that is what we should prepare for, of course with Godly discernment and wisdom. After all it is all for His glory and honor - good times or bad He is the Reason we live. Billy just say what you're a thinkin will ya. Too much beatin around the ol bush. Tis amazin' and sicknin' tho isn't it to watch our leaders lead us into the abyss, and apparantly against the will of the people. We are a breath away from a Marxist dictatorship of some kind-maybe that is how the Lord will discipline our nation. Oh bugg...yea I just haven't signed up yet. Oh one mo thang....my heavens I have seen some disturbing things before but have you seen these videos of children singing praises to BHO? Makes me want to cry, my heart aches for the deceived following the folly of man. I would cry even if they were singing to Bush or Reagan or me. Only God deserves that kinda praise. Rob from Alabama, the way they do it in N. Korea, Iran, Saudi Arabia, China, etc. is exactly what the Tribulation saints (if not us as well before the Rapture) are going to have to go through. I've figured for a while that the mega-churches that have sold out will be the only churches that will be able to stay in business. Smaller churches with leaders who won't back down on what the Book says will be forced out and the doors will be shut by gov't edict. C'mon, we've already been labeled "terrorists" by Homeland [in]Security because we question the Obamassiah's place of birth, time of birth, and his Marxist ways among other things. Also because we HATE abortion and try to turn sexual deviants from their ways. For that we are "terrorists", and I think soon we'll have to hide like them. The "Christ in Prophecy" Facebook group is available at http://www.facebook.com/group.php?gid=51007853998, Rob. The article you may be referring to is Whose Yo Daddy? The U.N.? In response to your earlier comment re: how to deal with the way things are going on in this nation, I would recommend Dr. Reagan's Book "Living For Christ in the End Times". The description (from the "store" section of this website reads "A hard-hitting commentary on how Christians are to respond to the decay of society and the increasing apostasy within the Church. The book is divided into three parts: The Descent into Paganism, The Christian Response to Paganism, and The Victory over Paganism. The book is full of practical guidelines for triumphant daily living in the power of the Holy Spirit." I started re-reading it this morning. I think you'd find it helpful.